A private dining experience with a twist is booking fast for the festive season – featuring four Solardome® PODs! 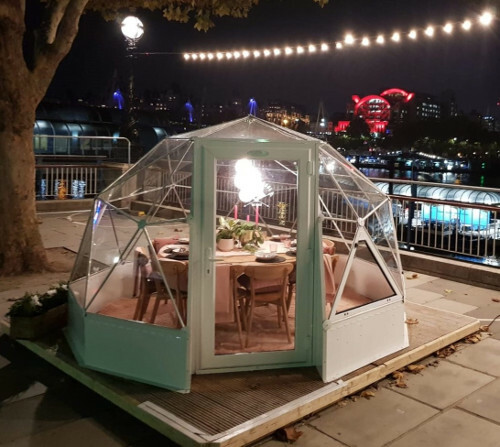 Jimmy’s Pop Up Restaurant, located next to the Waterloo Bridge in London, opted to use Solardome Industries to upgrade their heated dome solution for 2018 – going one better than the plastic versions they had previously used. They chose our 3.6m diameter glasshouses, which were shipped from our Southampton HQ in October and successfully assembled by Jimmy’s team within a week. Each geodesic dome will host up to 10 guests who will enjoy a seasonal three-course meal while admiring the views on the Thames River. The PODs also featured on ITV’s Lorraine show on Thursday 8 November. The igloo dome dining experience runs until 9 January 2019.